This June, slouched on foam pads in a trench dug in the snow atop Alaska’s Ruth Glacier, some 12 miles from Denali, the highest summit in North America, eight of us are sitting around drinking PBR. From time to time, we all look eastward across the ice to the near vertical rock face of a mountain ingloriously called the Stump. Somewhere up there, three of this country’s finest climbers — Alex Honnold, Renan Ozturk, and Freddie Wilkinson — are making their way up a new route. They are only a few miles away, but they might as well have stepped off the edge of the earth, made invisible by the scale of the mountains that line both sides of this glacier: two unbroken rows of dark granite soaring 5,000 feet above. It’s essentially a Grand Canyon filled with ice. Sometime late tonight or early the next morning, the climbers will rappel off the rocks, clip back into their skis, and trudge back to camp through the perpetual daylight of the Alaskan early summer. That is the hope any- way. 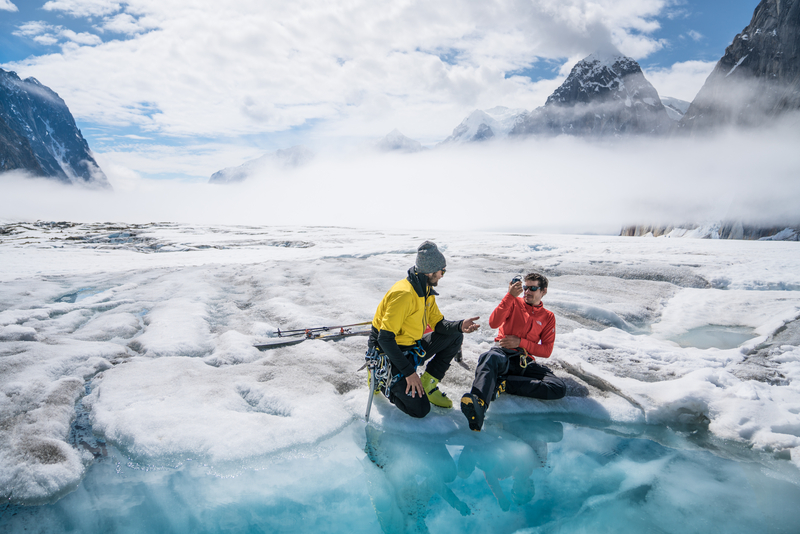 In the meantime, our group — two support members from the climbers’ team; three staffers from the North Face, the company underwriting this expedition; and two guides from Alpine Ascents — crack another cold one in the warm Alaskan sun. One of the unheralded realities of alpine climbing is that you spend a lot of time sitting around camp waiting for the weather to clear or the conditions on the mountain to settle down. Or you take up the downtime by finding another peak to climb. Which is what Honnold, Ozturk, and Wilkinson are doing a mountain called the Stump. Honnold, the most celebrated rock climber in the world, is not known for his alpine feats. This is his second trip to the Ruth Gorge, and while he pulled off some impressive ascents in 2013 with Ozturk and Wilkinson, he admits his debut in the big mountains wasn’t exactly a natural adjustment. “I was totally out of my depth,” he says. 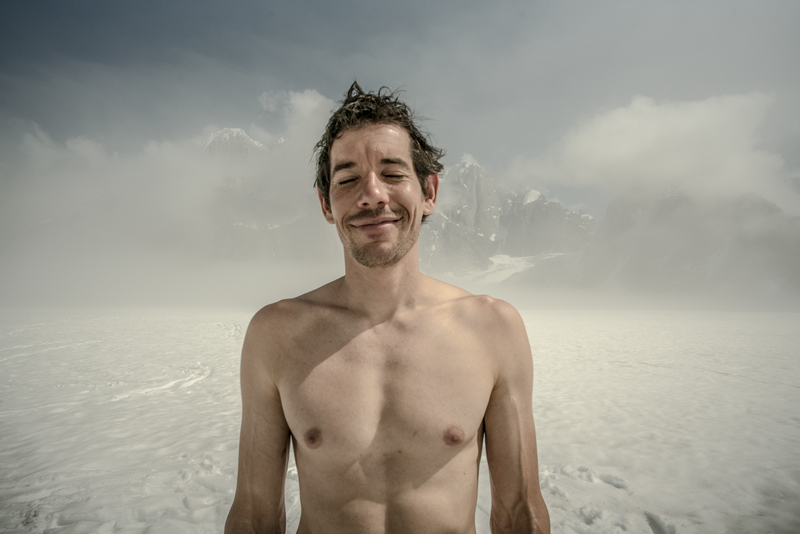 Ozturk recalls that Honnold was such a fish out of water that, at times, he would climb by putting his fingers in the holes made by his partners’ ice tools, rather than use his ax. For his preferred discipline, Honnold often wears shorts and climbing shoes, and that’s it. Mountaineering requires crampons, ice axes, heavy boots, and layers and layers of cold-weather gear. The alpine game has a totally different psychology, too. Climbing at lower altitudes is about choosing the right conditions. In the big mountains, you have to submit to the conditions you find. When the crew land on the glacier and get their first glimpse of the route, they know it’s going to be a long shot. Mount Dickey is still streaked with moisture left by melting snow and racked by rock and ice falling off the slowly thawing face. So their grand Alaska expedition is shaping up to be, as many do, a lesson in patience. Adding to the uncertain mood is the fact that two weeks before, Honnold had pulled o one of the greatest feats in climbing his- tory: a ropeless free solo ascent of Yosemite’s El Capitan. A media frenzy is currently swirling around him — in a few weeks, he’ll appear on Jimmy Kimmel Live! with 50 Cent — and he’s dealing with an avalanche of press requests and sponsorship obligations. In many ways this trip comes at the perfect moment for Honnold, allowing the star climber to sneak off to the mountains. But you also get the sense that he’s having a hard time mustering the motivation to tackle another massive project so soon after El Cap. Thus, at least for today, the Stump. As evening falls — not that you would know it — and with no sign of the climbers, our team clips into skis and pushes off from the advanced camp on the glacier to our more comfortable digs, set up on terrafirma, next to a snowfield where the bush planes land. We won’t know for sure until the next day, courtesy of a GPS cellphone linkup that intermittently connects their base camp with ours, that the team has succeeded on its new route during a 14-hour push. Honnold says he doesn’t know what’s left for him to do as a free soloist, but it’s fair to say that for now, he’s taken the art, and the risk, of the game to as high a level as any more or less sane person could. That’s why we’re in Alaska: Climbing higher-altitude “big walls” is a logical progression for him. The Wine Bottle Route seems custom-made for Honnold’s talents. It’s basically a giant buttress, almost vertical in the early pitches, like El Cap. It relents to lower-angled sections farther up, but those can be even harder going as the rock gets crumbly and the snow piles up. Two Austrians succeeded in topping out on it in 1988, during an epic five-day siege. But the Austrians occasionally resorted to using aid techniques, driving pitons or bolts into the rock and then boosting themselves up. What this American trio hopes to do would be extraordinary: climbing the route in a single, 36-hour push, using rope and gear only for protection in case of a fall. “It would pretty much be a breakthrough,” says David Roberts, the co-author of Honnold’s autobiography, Alone on the Wall, and one of a trio of climbers who made the first ascent of Mount Dickey’s east face by a different route back in 1974. In this effort, Honnold is the team’s secret weapon, able to shrink the size of giant alpine walls by climbing at heretofore unimaginable speeds. But two days later, when my group skis into the climbers’ base camp, the expedition is effectively over. Dickey is not drying off fast enough. That leaves open the possibility of an arduous, multiday push on one of the other major peaks in the gorge, akin to what the trio had done in 2013. As it turns out, Honnold chose not to climb at all. With the cachet of the Wine Bottle off the table, he wasn’t keen on risking his life on a dangerous secondary climb. Instead, they decided to ski partway up and down the lower-angled west face of Dickey. By the time we arrive back at their glacial camp, they’re back from the excursion and taking care of some corporate business, Honnold gracefully submitting to a North Face interview, shot by Wilkinson. Later, hiding from the debilitating sun under the cooking tarp, the gas stove eternally bubbling away to melt ice, the team decompresses, joking about anything, often about Honnold. He’s one of the gang but also somewhat apart, the guest star, and a slightly eccentric one at that: throwing himself into calisthenics to maintain his muscular fitness, letting Ozturk take photos of him that show off his post–El Cap ripped physique, and holing up in his tent and reading a small library of wonky public-policy books. “I’m going to write a screenplay about a great athletic talent withering away on an Alaskan glacier,” Wilkinson quips. On point, Honnold pokes his head in the tent where I’m temporarily splayed out. His face, burned pink, slathered in zinc sunscreen that doesn’t quite do the job, tells me that it hasn’t been an easy week. “It’s a beautiful place, a magical place — and I can’t wait to go home,” he declares. “How many 5.10’s have I done?” he says of his rock climbs. “Except with the ones here, I have the possibility of dying on rappel.” I confess that I too have serious concern about the risks we’re all running even skiing over a glacier that, because of a light winter snowfall and warm spring temperatures, is rife with danger.